Looking for the lost streams, kills, rivers, brooks, ponds, lakes, burns, brakes, and springs of New York City. The western outlet of the Collect was a small stream which left the pond at its northern end and flowed, nearly on the line of the present Canal Street, to the Hudson. 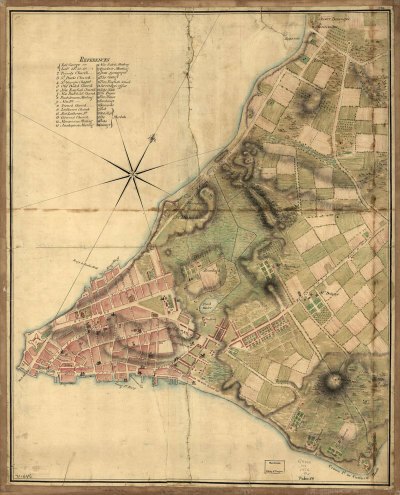 ....there spread the broad pasture land, swamps, and salt marshes of Lispenard Meadows, which extended to the shore line (just beyond Greenwich Street) and from Duane Street on the south to Spring Street on the north. Through these meadows the stream from the Collect flowed sluggishly, spreading out over the low land, but maintaining enough of a channel to permit the passage of small boats from the river to the pond. A little brook, draining another swampy valley whcih lay at the foot of the western slope of the Kalch Hoek, followed, substantially, the line of West Broadway from Reade Street, and entered the larger stream nearly at a right angle. On the northern side a tiny rivulet trickled down from a fine spring whcih gave the name Spring Street to the road which passed it, leading to Broadway. The Canal Street stream was apparently large enough that prior to the european settlements, the natives of the region could canoe (at least at high tide) from the Hudson river, along the stream, and into the Collect Pond, carrying deliveries of oysters that would be opened and dried for winter food. According to Old Wells and Watercourses..., this helped create the huge mounds of shells that the Dutch found around the Collect pond. This led to it being called "Kalch Hoek," meaning Shell Point, which was probably corrupted into "Collect" later.